-- Please Choose an Option --	KNEE LENGTH 43-45" LONG LENGTH 54-56"
Back by popular demand . . . The Dream Dress! 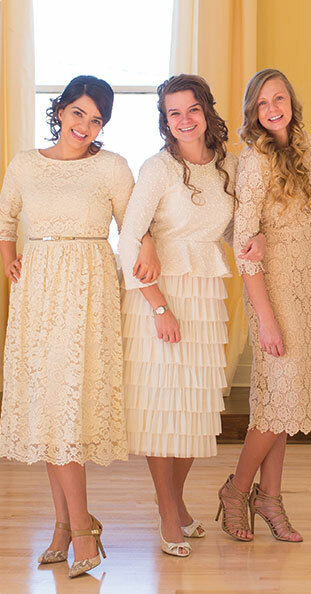 This dress really is every modestly dressed woman's dream. The fabric is beautiful and comfortable, and the tulle ruffles are simply exquisite. We love this piece as a bridesmaid dress and for dressy occasions. Wherever you may be going, you can be sure the Dream Dress will take you there. A beautiful sash is included for when you want to keep it classy, or add a fun, colorful one of your own if you're feeling more sassy! You can even make this dress casual: pair it with a jean jacket and wedges, and you're good to go. Available in two lengths.